I took this picture in Glacier National Park while driving the Going to the Sun Road. I added a purple filter for the fun of it. 🙂 The scenery here is spectacular. I saw two mountain goats on the side of the hill right before my family drove through a tunnel. Of course, this would be the one time I didn’t have my camera ready. Maybe next time! Wishing you a wonderful week! 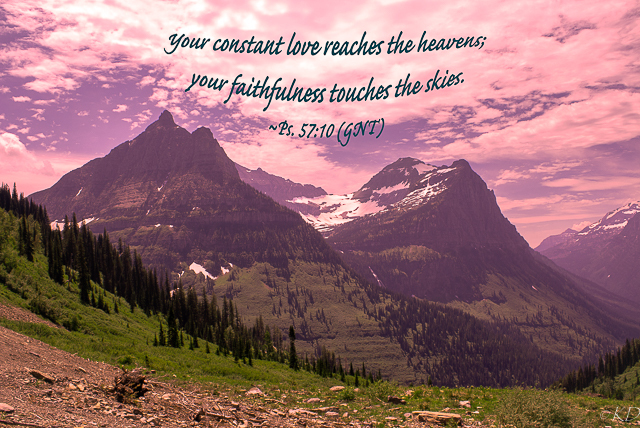 This entry was tagged Christianity, Glacier National Park - Going to the Sun Rd., God's faithfulness, outdoor photography, Psalm 57:10-Your love reaches the heavens; your faithfulness touches the skies. Bookmark the permalink. wow—-glorious!! The filter effect is great! It is beautiful country. I love the mountains and water. Blessings, Friend!